All I’m saying is I’m buying a trifle bowl! My roommate made this tonight for my birthday!!! Thank You Thank You Thank You. It was amazing!!! This looks so incredibly good and I’m planning on giving it a try this Saturday for my son’s very small birthday party (he’s not a big cake fan). One question…at the top of the recipe, it mentions that the PB mixture layer is from ‘this’ PB pie recipe. But that PB ‘mousse’ also includes sweetened condensed milk, vanilla, and lemon juice. Do I add these things or only use PB, cream cheese, powdered sugar, milk, and then fold in the whipped cream as your recipe mentions? Thanks! Amazing!!!!! Love making torte’s and trifles. Easter will be the unveiling of this one! Can hardly wait. This looks good enough to die for! I loveee the pb and chocolate combo. Keep up the great mouthwatering photos and recipes! I made this over the weekend and it was a huge hit! The only thing I did differently on accident was used 1/2 cup powdered sugar in the whipped cream instead of granulated and it actually came out better. Then I only used 1/2 cup powdered in the peanut butter/cream cheese mixture. Oh, and I used the Jello Indulgence chocolate mousse temptations and chopped Reeses pb cups. YUM! 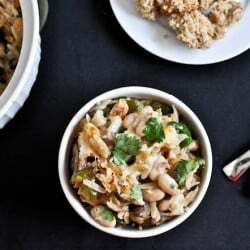 Hi, I just found your blog, via pinterest, and after reading this post, and recipe, I can tell this is the start of a long blogging and fooding relationship. 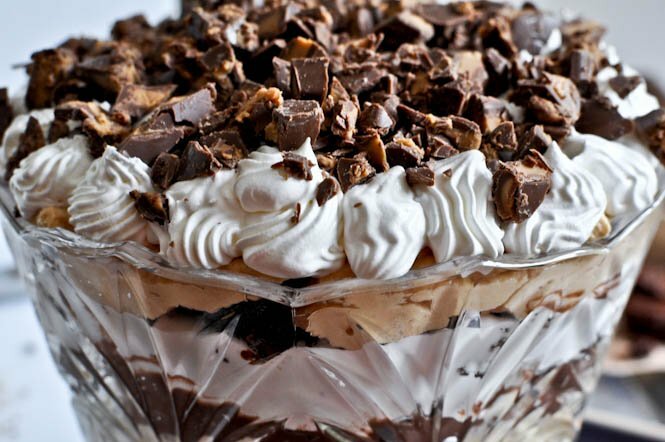 I think I’m gonna have to make this trifle for Easter dinner dessert. It looks ah-mazing! Can’t wait to try out more recipes!! I was wanting to make this the night before wondering if I might use cool whip in place of the whip cream ? I didn’t think the cool whip would break down like the whip cream might. Any thoughts ? Cool Whip should be fine! I want to make this for a shower tomorrow. I see that other made it the day before. Have you tried this? Or should it be made the day of? Does it stay as pretty if made in advance? I haven’t tried personally but it seems like it’s been okay for others. I worry about it sinking though. What if you made everything/mixed everything and stored it in the fridge today, then layered it first thing tomorrow morning? I made this for a friend at works birthday today! Everyone loved it! It was nice and light and fluffy and just rich enough! Thanks! I made this today for our Teacher Appreciation Week luncheon. It was a HUGE hit! Thank you for a wonderful recipe that I have now shared with all the teachers at our school. I made the brownies, pudding and peanut butter mixture the night before & then layered the next morning. I also used Cool Whip in place of homemade whipped cream to save time (and because I had some in the freezer). Can’t wait to make it again! I was going to make this for a get together we are having, but I’m confused. It referenced using the peanut butter pie filling from the other pie recipe, but in your directions and ingredients, it looks like you make it minus a couple of pie filling ingredients (sweetened condensed milk, vanilla and lemon). Which version of peanut butter filling should be used? Have you made this with the pie filling ingredients? Just wondering how the sweetened condensed milk would do in this or should it be omitted. Hi Charene – which PB filling recipe did you end up using? with or without (condensed milk, vanilla, lemon)?? 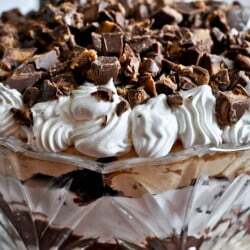 Pingback: Peanut Butter Fudge Brownie Trifle! Delish! The last ingredient is 8oz whipped cream cheese. When do you add this ingredient? Thx! You add the whipped cream cheese to the peanut butter-see the second paragraph after the list of ingredients. I’m with Charene,I don’t quite understand the peanut butter pie filling? Do you use just the filling from the other recipe? Just the heavy cream,peanut butter,confectioners sugar,cond. milk,vanilla and lemon juice?? Thanks, sound like a great recipe.Can’t wait to try it!! Mary – did you end up using the recipe with or without extra ingredients (condensed milk etc)?? Made this tonight and there were no leftovers. Used coolwhip rather than whipped cream and it held up nicely. This one is a keeper! Brownies are in the oven.. pudding is in the fridge.. cool whip is ready to go. I left out the peanut butter bc I’m taking it to my cousin’s for dinner and her son is allergic.. and only had hershey chocolate on hand so gonna use pieces of that. Let’s hope it’s as good as yours. Cannot wait! Like a couple others that have commented, I’m a bit confused on the peanut butter filling part… the pie recipe includes extra ingredients (sweetened condensed milk, vanilla, lemon juice) – so which recipe do you use for the peanut butter filling? I made this and it’s great! My family loved it! I know some people had been asking about which PB filling recipe to follow. I just used the one she listed in the directions. I think she just added the PB pie filling link as a reference….mine turned out great with just the PB, cream cheese, powdered sugar and milk. Hello! I love your recipes! I went to follow the link for your peanut butter layer in this trifle but the link (for-mikey) literally went nowhere. Could you point me in the right direction for that layer recipe? Thank you! The Peanut Butter filling link seems to be broken? I too found this on pinterest. To answer a few peoples questions, I did not use the Peanut Butter Filling link. I just did what she said to do and did the peanut butter, cream cheese, milk, and powered sugar and the cup of whipped cream. Came out great. At first we thought it was decent, it was too airy, and too much like a mousse and lacked a thick consistency, but it was still really good and had a wonderful peanut butter taste. The next day though after letting it sit in the fridge all the ingredients got thicker and it was AMAZING. I will definitely be making this again, but will let sit in the fridge to ‘harden’ over night. Such a great recipe. Thank you for commenting on how it was “sitting overnight”, because I want to make this for our fellowship tomorrow and I was going to make it tonight beforehand.. but I was worried how it would be, but since you said it was better the next day… I’m going to do it!! how do i get recipe for the peanut butter pie filling??? Could you please estimate how many cups of chopped up brownies would come from “a batch” of brownies. I want to buy ready-made brownies rather than making my own. Recipe sounds terrific — thanks! My husband does not like chocolate desserts, which means when I make this I will have to eat it all myself. That’s just the hard kinda life I lead bwah ha ha….